Pair of armchairs by Raffaella Crespi in green textured velvet, Italy, 1960s. Produced by Mobilia. Literature: Domus, n. 373 December 1960, advertisement. Domus, n. 400, March 1963, review. Complimentary shipping within the Netherlands. Price is for the pair. Item has been re-upholstered by the previous owner in beautiful green textured velvet. Wooden armchair, the Netherlands, 1950s. 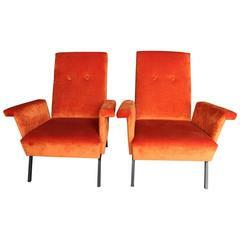 Pair of 1960s small armchairs in orange velvet, metal structure new fabric and padding. 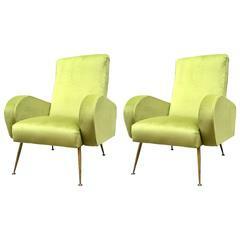 Pair of 1960s Italian armchairs, wood and metal frame with dorad brass feet, re-tapizados in intense green velvet. Very nice pair of chromed metal armchairs, with green velvet fabric entirely upholstered. Rounded back but not rotating. Very comfortable seats. Pair of beautiful 1960s armchairs in black cotton velvet, padding hypoallergenic polyurethane foam, black walnut legs.